The Haeger Potteries company was begun by David H. Haeger in 1871. The firm that began as a brickyard in Dundee, Illinois continues to this day as one of the few remaining large-scale manufacturers of industrial artware. The firm began producing artware in 1914, and the contributions of former Fulper employee Martin Stangl to its success is probably incalculable. While Haeger produced a less expensive product than Fulper (by using a lighter clay body and high gloss, low-fire glazes), there is an undeniable similarity between the early products of the two firms. Haeger pottery has not kept pace value-wise with the products of its former competitors (like Red Wing and Hull). This is somewhat undeserved. 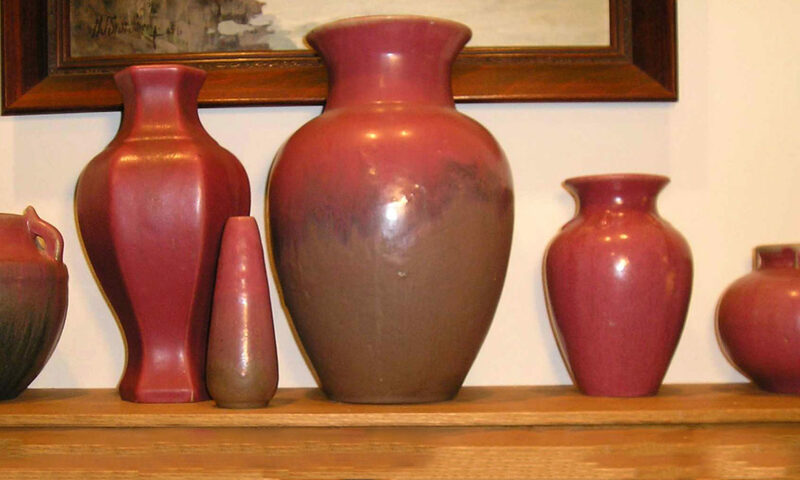 Haeger vases and figurals often have modeling and glaze quality of great invention and skill. While the Art Deco designs of Royal Hickman have always attracted some attention, the pre-Hickman era Haeger pottery is particularly undervalued, especially the ware designed for the the Arts & Crafts market. Collecting Royal Haeger by Lee Garmon and Doris Frizzell. The book is useful primarily for its reproduction of catalog pages. Martin Stangl joins the Fulper Pottery as Superintendent of its Technical Division. Martin Stangle buys out Fulper and produces Stangle Pottery. A Bronze Green glaze, similar if not identical to an early Haeger glaze, is among those featured. Royal Arden Hickman (1893-1969) begins RaArt Pottery in California. Hickman employed by Haeger, becomes chief designer for Royal Haeger line. The Buckeye Pottery Building in Macomb, Illnois is purchased by the Haeger Company for the manufacture of floral artware. Hickman designs black panther figurine (in three sizes: 18″, 24″ & 26″) for Carson Pirie Scott in Chicago. Extremely popular, the panther design was copied by nearly 30 other potteries. Royal Hickman leaves Haeger Potteries. Hickman establishes Royal Hickman Industires, a lamp manufacturer in Chatanooga, TN. The company is sold to the Phil-Mar Lamp Company of Cleveland and renamed Ceramic Arts, Inc.
Eric Olson becomes Haeger’s chief designer. Haeger employs Royal Hickman as a free-lance designer and consultant. Joseph F. Estes becomes president of Haeger. Elsa Ken Haeger designs Haeger’s Royal Garden Flower-ware lline (produced through 1963). Sascha Brastoff designs the Esplanade and Roman Bronze lines for Haeger. Nicholas Haeger Estes becomes president of The Royal Haeger Lamp Company. Alexandra Haeger Estes becomes president of The Haeger Potteries of Dundee. C. Glenn Richardson becomes Haeger’s Director of Design. The Haeger factory’s website, featuring their current catalog for their floral & art ware, and history.